We are a family of 2 breeders (2 generations) located in Anderson, SC, (30 minutes West from Greenville, SC & 10 minutes East from the border line of Georgia.) and Sanford, NC (45 minutes South-West from Raleigh, NC). We have been raising Siberian Huskies since 2005, AKKs and Dobermans since 2010. While everyone in the family contributes to helping with the dogs and puppies, I have to say that they are my abiding passion and the children are just tagging along because of me. The family much prefers to be the petters and players, while Mom is doing the cleaning and caring. Of course, that means the dogs usually like them better because they know I’m liable to give them a bath or a shot! I have to stop here and say that I don’t use the term “Hobby Kennel” when describing my dogs and myself. While this term is used by many to identify individuals that breed for the betterment of the breed and not for profit. I don’t feel that the word “hobby” is a complimentary description of my commitment to my dogs. I have devoted more than 10 years of studying and breeding Siberian Huskies, AKKs, and Dobermans and developing superior bloodlines, conformation, and temperaments in my dogs. For years, my family’s home life has revolved around providing care for our dogs and puppies and doing the best we can to provide them with everything they need. We rarely, if ever, get family vacations and if a holiday rolls around and I’m not bottle feeding a too-small puppy or babysitting an expectant mother, I feel like something’s missing! I most definitely do not view my interest in dogs as a “hobby” and my animals never take second place to a “real job”. My dogs are a full-time, 24/7, 365 day a year passion. I have NEVER left a female at home to whelp alone! I have always believed that my “job” was to provide my dogs with support, care, and attention whenever necessary. Since every breeding, pregnancy, and birth are due to my influence, it’s my responsibility to be present to support or help the dogs if necessary and to make sure everything goes “right” in any situation. This means my “job” requires sleepless nights and days to help with whelping and watching over nervous new mommies. I also have to be available to nurse weak, orphaned or rejected puppies for as long as necessary. 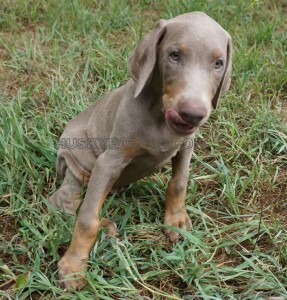 (This can mean every 1-2 hours as newborns and for as long 4-8 weeks for especially small, weak or sick puppies.) This is what is required of a responsible breeder and this is what I do for my dogs. Additionally, I believe in breeding for the betterment of the breed and in producing the best dogs I can. I make every effort to stay current on breed issues, concerns, and I do my best to breed the happiest, healthiest dogs possible. I stand behind all of my dogs and am always available to answer questions or help new owners. So, as I was saying, while “hobby kennel” may be the politically correct term for what I do (since I DO NOT sell to dealers, brokers or pet shops! ), I certainly don’t want anyone to think that this is something I do on weekends, after work or when I have some spare time! This family started to breed Siberian Huskies in 2005 and Doberman Pinschers in 2010. This family moved to SC in 2003 where one of their brothers had Siberian Huskies. They were more than happy to help him take care of his dogs when he had to leave home for some business trips. After doing this for a month or so this family got attached to Siberian Huskies. Their personalities. How active they were. Since the children play with them all day long. They love the idea how the children had dogs that were considered as brothers and sisters. They soon started thinking about breeding them. Since they wanted people to fall in love with this breed as much as their family did. So they started doing extensive research where they will take days on the internet and reading books to learn everything about the breed and dogs in general. After the extensive research on the breed and how to properly breed dogs, they started breeding in 2005. They soon wanted a breed that will protect the property, house, family, and pets. Once again turned to the internet and books to do extensive research on breeds. They came across the Doberman Pinscher breed. Then they proceeded to get a puppy. A 4-month-old Blue/rust male that they named Cosmo. They fell in love with this boy and the breed. (Italy says that the Doberman Pinscher is her favorite breed). They then got an 8 week old Red/rust female named Katniss. With these two they started breeding Doberman Pinschers as well in 2010. In the beginning, they will provide the new owners with a pack of papers about the breed and dogs in general. Then in 2015, they decided to launch a website with all the information. So not only will they provide people the joy when they get a puppy from them they can also provide the general public information about these breeds. That is when they launched Husky Palace. This family started breeding Siberian Huskies in 2010. 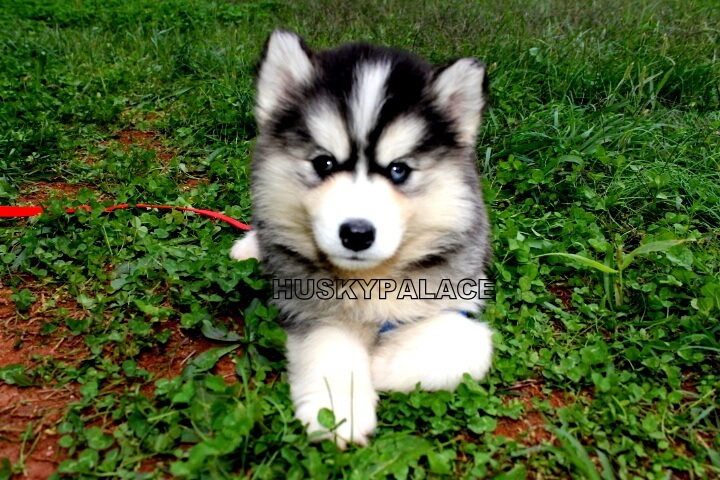 They got a red/white male Siberian Husky puppy in 2008 named Blaze. Soon after this puppy, they got Shakira, a black/white female. They decided to breed them once since they also love the breed and their child love them as well! So in 2010, they had their first litter. They fell in love with breeding. Since they love the idea of finding them homes and seeing them grow. Additionally, the child loves seeing puppies around the house. So it was a win-win for everyone. After this so call one time to breed their two beloved pets they decided to become Siberian Husky breeders. The bottom line is we treat all our Siberian Huskies, AKKs, Dobermans puppies with love, give them proper health care & give them all the attention they can get!